Pigs produce meat. A pig show awards pigs that have the best chance of producing high-quality, lean meat. Five to six-month-old pigs with a market weight of 200 to 280 lbs. compete in market hog shows. 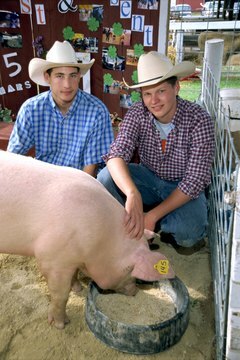 Gilts, young females, and boars, male pigs used for breeding, compete in breeding swine classes. In showmanship classes, the exhibitor is judged on his or her ability to show and groom the animal. Showing pigs involves raising, grooming and training pigs for a competition. There are regional differences in showing pigs throughout the United States. However, a number of basic steps ensure successful competition at a pig show. Select a pig with desirable conformation. An ideal pig has thick muscling in the ham (rear), loin (back) and shoulder. The pig is structurally sound and moves freely. Ideal pigs exhibit a long, lean, deep body. For market hog classes, the hog must meet the required weight. Train the pig at home prior to the show. Pigs are driven, not led with a halter. A driving tool such as a hog whip, riding crop, small length of plastic piping or small cane is used to guide the pig in the show ring. Work with the pig so a light touch on the right side results in the pig moving to the left and a light tap on the left side turns the pig to the right. Exercise the pigs regularly to build stamina for the show ring. Groom the pig before entering the show ring. Wash the pig using mild soap. It is necessary to remove all dirt and stains. Following local or breed recommendations, clip the pig with small livestock clippers. Carry a small rag or brush in your back pocket. If sawdust or dirt gets on the pig in the ring, quietly remove it. Keep the pig between you and the judge in the show ring. Never block the judge’s view of the pig. Slowly guide the pig, keeping a 10- to 20-foot distance from the judge. Move the pig so the judge has a clear view of its side, front and rear. Hold the driving tool in one hand, switching hands as necessary. Bend slightly at the waist and have repeated eye contact with the judge. Follow all of the judge’s instructions. Do not move between fighting pigs. Occasionally pigs will start a fight in the ring. Stand back and allow a person with a hog board to break up the fight. Usually the fighting stops if the board separates the two pigs. Move the pig away from corners and don’t allow the pig to group with other pigs. If the judge asks for the pig to be penned, slowly move the pig to the desired pen. Open the gate, guide the pig into the pen, and latch the gate. Stand near the pig and wait for the judge’s instructions. When asked to leave the pen, calmly move the pig out of the pen and close the gate. Oklahoma State University; Swine Showmanship; Rusty Gosz, et al.